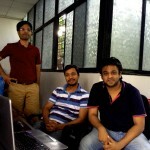 Kunal Lagwankar Co-Founded AdSparx along with Ketan Barhate and Lilesh Ghadi. They worked together as programmers ten years ago at Patni Computers and have been working together since then. They were in the domain of Internet Video Streaming all along and they found that the streaming in mobile is a big gap in the market and they left their jobs and began their first venture – Novix Technologies. The product they built was a Mobile TV Engine which was the first Direct to Consumer mobile app in India and people could go to website and just download an app to watch the TV channel of their choice. Similar products tried distribution through operators but ended up not being viable for those companies and hence they went through this route. This product – Mundu TV aggregates live TV channels and offer those programs as a live Mobile TV service for the end users. This was a simple technology solution and they did not think of any revenue models. Their company got acquired in 2008 and they had a successful exit. The three of them got together in their second venture in 2012 as an extension of the early business where they could do some monetization of their IP – a problem that they could not solve in their earlier venture. They figured out that lots of people were consuming the mobile content but there was no monetization model. The content is normally taken from broadcasters and streamed through the mobile as it is but the main revenue model of the advertisers paying to the broadcaster did not exist here because the same content was being played through mobile and no one could even think about how to monetize on the content that is getting streamed through mobile. To take the market to the product, they got in touch with people they knew with a filter of them being good publishers as well as a technologist. They found these people by speaking to them and finding out their technology appetite and the risk they were willing to take and did a Proof Of Concept with them and took their feedback. They did not get paid but they were optimistic that they had some platforms and good people to test their product with. With the development of the mobile ecosystem over the last three years there has been a revolution where many phones are smartphones and the device technology has changed but they had something that they could showcase to customers on how this system will be when it works and they could do a deployment, demo and show it to the customers. Kunal says that POC’s only will work especially in the initial days which was free of cost. They did not want to do it with too many customers as that will dilute the effort they will put to get a good POC out with serious buyers. They went after customers who had a good appetite for new technology and can validate their product. They chose a select few of them from each domain – ad networks , content aggregator, TV channels and did a POC on how they can do Ad sales through mobile streaming. The founders themselves did cold calls, reached out to people and sold. They did no marketing at all because they believed selling personally to be the best way to get deals. They occasionally did Trade shows and got follow-on meetings but they used their contacts pretty well to get started. Kunal’s suggestion to aspiring startups– Lot of people/customers can misguide you by talking to you, wasting your time but not giving you any business and hence you have to find out who will make the cut and then spend time with them and cut the others. Do not worry if some of your customer acquisition strategies will not succeed but you will fail big time if you do not learn from your mistakes. You have to find out a way to profile your customers and they let go of a few of them because they will not be able to drive you in the right direction. Adsparx,(http://adsparx.in/) is now signed up with all the broadcasters in India and is entering US, Canada and Western Europe as they have realized that the potential of the product is global . They have around 12 employees that is building the core product. They were part of the 3rd batch of Microsoft Venture Accelerators and were also part of the five shortlisted companies from India with Ryerson Futures – A Toronto based Accelerator and spent some time in Toronto. They also got a funding from top investors – combination of angel networks from Indian Angel Network, Mumbai angels, GrowX Capital and a group fo individual investors.